The Barnes and Noble Nook of e-readers is one of the most successful ventures by a company introducing an electronic book reader to the market place. The company does suffer from a number of lingering issues that have been failed to be addressed. The company could even be accused of trying to do too much too soon and many users are claiming a myriad of problems. One of the main problems is the inability for customers outside of the USA to procure and use the device. Barnes and Noble does not ship its e-reader outside of the USA and will not do custom orders outside. This means if you are an international user you are basically out of luck unless you buy it from EBAY or our retail partner SHOPEREADERS.COM. There are many other companies that carry the Barnes and Noble Nook line of e-readers in a retail setting, such as Target, Walmart and Staples. These companies do not ship outside of the USA either, remarkably diminishing availability. Because the Nook is not sold outside of the USA, you cannot register the device and shop the ebook store unless you do a few things. We recommend registering your device to a fake USA address or an existing one such as an Art Gallery or Post Office. If you have moral qualms about doing this, you can take out a PO BOX or use various proxy companies in the USA that allow you to use their virtual office as an address. Once you do this for your billing and shipping address when you are registering your device you can use your local credit card to pay for purchases. So if you live in Canada, Mexico, Europe, Australia, or any other country, you can use your real credit card and name. Just make sure to use a real email address, because this is the only way the company sends you purchase confirmations. Barnes and Noble will never ship anything to your registered address, only your email account. One of the most other common problems we hear about at Good e-Reader is the LENDME functions that allow you to share select ebooks you purchase from the Barnes and Noble eBook store. If you have an email address that is associated with your B&N account of your friend you can lend a book out for a duration of two weeks. One of the most prevelent concerns is that books can only be leant out ONCE. When you lend a book out you cannot ever lend it out again and many users are not aware of this. Barnes and Noble implemented a update earlier on that allowed you to read full versions of books on your device when you are in a physical book stores. This feature is very buggy for a number of reasons. We have heard reports that when you open up a large percentage of books it immediately kicks you out of it when the book loads on your screen. It then says that your reading time has expired even though you just opened it. One of the reasons why this occurs is if you visit more then one different Barnes and Noble retail setting. If you try and load up a book that you are reading at the store, quit and then go to another location it will often crash when you load that particular book up. Many people often complain about the screen ghosting or flashing when you are turning pages. The Nook Simple Touch, WIFI and 3G versions all use e-Ink as the display technology which provides the true book experience. This technology often has refresh rate issues which result in sometimes a bit longer load times or ghosting of images/text on a screen. The Nook refreshes the pages every 6 pages so you can eliminate this problem by scrolling forward in a book. Alternatively if you notice the screen sometimes flickering and sometimes not, it is because you hit the six page threshold. Finally there is a small input screen found normally on the back of the device which is your hard reset button. If your device ever stops refreshing the screen or locks up you can insert a small pin and hit the reset button. This will manually reboot your device and normally fixes all of the problems. If anyone is experiencing problems not listed here, please let us know and we can help you resolve them. In my opinion, the title of this post is a little misleading because it states that the NOOK family of devices is “having lots of problems”, then goes on to address four issues, two of which are not problems of the device, but rather of policies established by Barnes and Noble and/or their partners in the publishing industry. I’m not going to write free content for this site in the comments section, but the issues put forth in this poorly researched/written article are not legitimate. Do your homework next time. I agree with “Posting has lots of problems”. Either the author of this article has a personal issue with B & N or they just aren’t a very good writer. As already stated, these “problems” are not problems. You can’t buy content from Barnes & Noble outside the US due to copyrights, not a problem with the nook. The Lend Me restriction is set by the publishers, not B & N, so go complain to them. The other two “problems” may just be minor bugs that can easily be fixed and are not widespread as to my knowledge. Lastly, there is no reset button you can press with a small pin on ANY of the nook devices. The only way to reset is to hold down the power button and power off the device or call support for a hard or factory reset. Very poorly researched or just fabricated article. the back of the devices that I own; perhaps the original nook has the button. Also, I don’t think the new nook simple touch has a 3G version yet, only wifi. problems with the nook eReaders. I thought the writer was going to uncover “lots of problems” with the nook ereaders, however that was NOT the case. This article is filled with dis-info and does a diservice because if someone did not own a Nook then they would probably be misled into thinking the Nooks actually have problems – which they don’t. As other commenters have pointed out most of the so called “problems” in this article are Barnes and Noble policies. I have had my original Nook for almost three years and I can’t remember having to reboot. And the statement that there is a hard reset button is a totally false. I also have the Nook Color and it doesn’t have a reset button. Angry Birds has locked up on me twice but I only had to close that particular app – the Nook Color was fine. As for the flash of e-ink being a “problem” all ereaders that use e-ink such as the Kindle have this “problem” but the Nook touch is the only one that has addressed it by only doing the total refresh every 6 pages. I have often used the “read in store” feature and have not had any problems execept once I bought the book and the “buy now” button didn’t go away until I got home. I didn’t buy a Nook, even though I think it’s the best e-reader device, for exactly the PROBLEMS listed in this article. If you live in the US, you can pick on the article’s author. But these are problems. Here’s one not listed: Even if you have a real USA address, real USA credit card, real USA phone number etc., once you’re abroad, you can’t purchase B&N books. The only workaround is a proxy server. Amazon enables overseas purchases (and charges an extra, unjustified $2 on every e-book purchased outside the USA), and Kobo quickly built relationships with overseas vendors, enabling Kobo users to buy e-books in their local currency (often at lower prices than in the US), and Sony makes no distinction about US versus non-US buyers, so Sony users can purchase anywhere. Meanwhile, no matter where I am, I can also buy e-books from Book Depository in England, and numerous other sites. Only B&N is stick-in-the-mud, typical American myopic “USA is the world and everywhere else doesn’t count.” If every other major e-book retailer can do it, why not B&N? This IS a problem, whether with the device or with the sales policy, it’s all intertwined. Add to that, the fact that non-B&N books can’t be highlighted, can’t be grouped with B&N books, and are relegated to a small portion of onboard memory, I have no regrets at never buying a Nook. My Sony Touch is top class! My wife took our nook to finland she was there 3 days it updated wiping out all the books that were on the nook and my serial #. they cannot fix the problem. 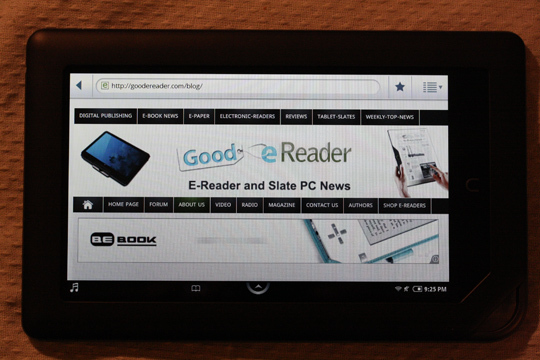 It is irresponsible to post that there are no problems with the nook because you have never had any problems yourself. The furthest anybody making comments has been is the Bahama’s look at a map, does the bahama’s look like they are overseas? They are just of the coast of florida. There are known issues with the nook that is not misleading. If you have not encounter these prolems why don’t you keep Your opinions to yourself. google- serial 0 see what that says about the nook or how the nook de-registers itself. Well, I read thru all the comments and am really surprised by the statements that Nook / BN has no problems. I have my second Nook. It is the colorHD+. I purchased it Dec 2013. All was fine until early Jan2014 (now out of warranty). It now gives a “critical battery” message and shuts down when battery power depleats to between 68 – 75%. This is a consistent problem. You must plug in power to use the Nook. This is very inconvienient when taking the book along to read away from home, which was a main reason for getting an e-reader. BN claims to be unaware of the problem and cannot provide a solution beyond offering to sell me a refurbished (with same problems I have???). Google the battery problem and you will find many owners with the same problem. And it all started about the ssme time. So what did BN do? Maybe one of you who says there areno problems with the Nook can provide a solution? Got charged twice for a magazine. $4.32. I have contacted B&N no less than 8 times by phone, chat and email and just get the run-around. B&N Nook is a scam. They either hope you won’t spot the small charge on your credit card or will eventually give up. Customer service is awful.